Hill's Great Eastern Railway (GER) Class E72 (LNER J18) was a development of the still saturated J17 goods locomotive. The J18 added superheating and piston valves to the design. The new superheated boiler was fitted with an 18 element Schmidt superheater, and continued to be interchangeable with the D14 Claud locomotives. The cylinder size was increased to 20x28in from the earlier J17's 19x26in. In order to avoid excessive tractive effort for the limited adhesive weight, the boiler pressure was reduced from 180psi to 160psi. The new piston valves were similar to those fitted to the B12 4-6-0, but they were inclined instead of horizontal. A distinctive feature of the J18s was the unattractive front overhang due to the use of piston tail rods. One batch of ten J18s was built in 1912. The design was modified in 1916 to remove the piston tail rods. This resulted in a reduction in the front overhang of 1ft 6.5in. The Schmidt superheater was replaced with an 18 element Robinson superheater. Vacuum ejectors were also fitted in addition to the J18's steam brake. Twenty five of the resulting GER Class T77 (LNER J19) engines were built in four batches between 1916 and 1920. A final order of ten locomotives was reduced to five, and modified to use the B12 boiler. These engines became GER Class D81 (LNER J20). All of the J18s and J19s were fitted with Wakefield mechanical lubricators. Six sandboxes for forward running and two in the cab for reverse running were fitted. The ten J18s and the first ten J19s were built with Lambert's water sanding. In 1922-4, these were converted to gravity sanding in line with the rest of the J19 class. Three of the J18s received Robinson superheaters in 1929-32. The remaining J18s kept their Schmidt superheaters until later rebuilding during the 1930s. Between 1934 and 1939, the J19s were rebuilt with the large boilers used on the D16/3. These boilers were fitted with round-topped fireboxes and 21-element Robinson superheaters. The new boiler also required a larger cab to be fitted. The rebuilt locomotives were classified as J19/2, and the un-rebuilt locomotives were classed J19/1. Between 1935 and 1936, all ten J18s were rebuilt as J19/1 or J19/2. The J18s that had been rebuilt as J19/1s had all been rebuilt as J19/2s by 1938. 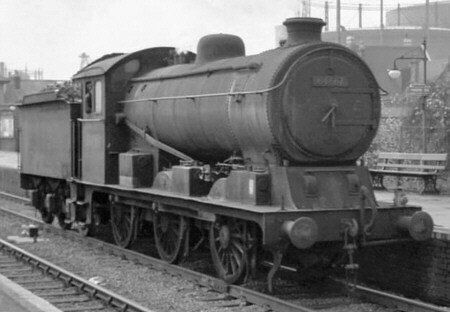 The J18s & J19s had been originally built with Ramsbottom safety valves. Ross pop safety valves were fitted as standard on the D16/3-type boilers, although they had already been fitted to some of the J18s & J19s. The new boilers were rated at 180psi on the D16/3s. The J19/2s were officially set at 170psi, but many remained at 160psi. The additional tractive effort was not required, and the entire class was reduced to 160psi in 1945-6. Six engines had their cylinders reduced to 19in or 19.5in in 1935-42. This was an attempt to improve their thermal efficiency by also increasing the boiler pressure at the same time. Maintenance costs were also expected to be reduced. The economic benefits were not considered sufficient, and no further locomotives were modified. Five of the modified engines reverted to 20in cylinders in 1939-50. The J18s were confined almost entirely to the goods traffic from Peterborough and March, due to their lack of vacuum braking. They remained at these sheds until after they were rebuilt as J19/2s. The original J19s had vacuum ejectors and could work fitted goods trains. Although they initially shared duties with the J18s, their distribution widened over time. By 1921, the J19s were allocated to: March (11), Peterborough East (9), Stratford (3), Lincoln (1), and Colchester (1). The LNER usually kept the J19s in East Anglia, but in 1924 J19 No. 8262 spent six months on Durham coal traffic and No. 8145 spent three months at Woodford. During the 1920s, the J18s and J19s were regularly overhauled at Doncaster and Darlington. During the 1920s and 1930s, the J19s became widely distributed across East Anglia. By 1939, they were allocated to Peterborough East (8), March (7), Cambridge (6), Norwich (5), Stratford (4), King's Lynn (2), Colchester (2), and Parkeston (1). The Peterborough engines often worked on the former Midland & Great Northern Joint Railway (M&GN). The M&GN's South Lynn shed received an allocation of J19s in 1945. Grantham also received six in 1942. During the 1950s, Colchester acquired a large allocation of J19s that could often be seen on goods duties to Whitemoor Yard va Long Melford and Bury St. Edmonds. Withdrawals started in 1958 and were very rapid. Two managed to survive until 1962, and these were withdrawn on 16th September 1962 with the last of the ex-GER steam locomotives. Superheater details for the J18 are for the Schmidt superheater version. The J18s were eventually fitted with Robinson superheaters, in-line with the J19s. Cylinders (x2): (inside) 20x28in. 20x28in. Heating Surface: Total: 1501.1 sq.ft. 1429.9 sq.ft. Firebox: 117.7 sq.ft. 117.7 sq.ft. Grate Area: 21.6 sq.ft. 21.6 sq.ft. None of the J18s or J19s survived into preservation. An J19/2 etched kit is available for 4mm scale from PDK. Ace Trains have announced a model of the J19 for O gauge. Thank you to Malcolm Peirson for the photograph of J19/2 BR No. 64667.